Indepen-dance provided 3 x weekly creative movement and dance sessions over 43 weeks for adults with learning disabilities in Glasgow. This offered participants the opportunity to take part in a dance activity and to develop friendships while giving their carers a regular. Indepen-dance provided two different activities 2 x Creative Movement and Dance Classes each Wednesday for 43 weeks and a Friday night social class for 43 weeks , both activities were for disabled adults. 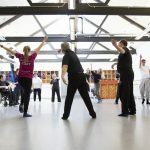 The classes held on a Wednesday are for disabled adults who want to further develop their skills in dance and be part of a regular activity which will also involve them being part of annual performance projects. This class is held in Scottish Ballet’s Education Suite, the classes begin at 10.30 – 12, the group have lunch together for an hour and then participate in a second class 1- 2. Parents drop off their sons and daughters at between 10/10.30 am and return to pick them up at 2 pm. During this time the disabled participants are involved in a dance activity facilitated by an experienced dance tutor and assistants and volunteer. Indepen-dance provided a staff member to supervise during the lunch period and accompany some of the dancers home at the end of the day. 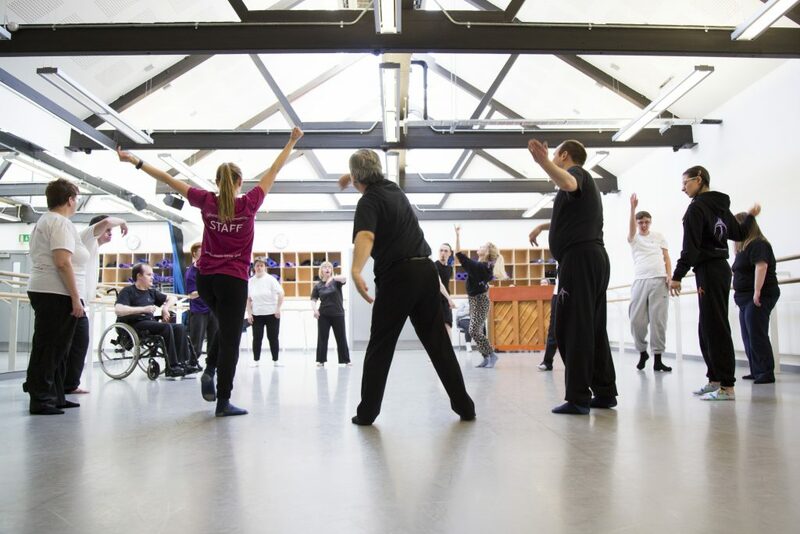 The day provides the disabled adults with a meaningful creative experience, which develops dance skills as well as being part of a group activity where they develop friendships and socialise with others. At the same time parents are receiving a well-deserved break from the caring role. The Friday Night Social class, as the title would suggest has a social element to it, participants take part in a creative movement and dance class from 6.30 - 8pm then head to the pub next door for a game of pool and some drinks and socialize with each other, this last until around 9pm but some of the participants have built up their confidence to stay on a little longer. Our project didn't work with carers directly but we know from direct conversation with parents that they use this time to do a variety of things, using this time to have some quality time for themselves. Our project offers mutual benefit to both carers and disabled participants a key priority for the Creative Breaks funding. Our project went to plan. The Beast from the East did effect our delivery of classes for one week. 2 participants who have attended our Friday Night Social Class are now attending other classes in our core programme. As previously mentioned Indepen-dance has been providing this service for a number of years, each year we have had to add more classes due to the demand. The Creative Breaks Fund criteria fits exceptionally well to the service we provide and has been funding this activity for a couple of years now. We know that there is no guarantee that the funding will continue but we know from evaluations and feedback with carers/parents what the benefits are to both them and the participants means, so our challenge is to provide a service that is sustainable for the long term future that requires us to continue to seek funding from a variety of sources for the future. As we communicate with participants and their carers/parents on a regular basis we are always listening to what other activities we could provide. Over the years we have developed excellent partnerships, Scottish Ballet gives us the use of their education suite to host our weekly adult performance company classes, challenges arise when they can't give us access to their space and we have to find an alternative accessible venue, they are very difficult to find. For the first time in many years we had to cancel a selection of our classes due to the arrival of the Beast from The East which created havoc in Glasgow the wider UK for a period of 3 days, we compensated our class participants but had to still pay for venue hires and freelance staff's salaries due to the short notice. It was brilliant for us to find a fund that's criteria fits with our activities, as previously mentioned we have been providing our core programme of activities for over 22 years, as such many people have benefited from our service and some have progressed through the company to become a volunteer or secure employment with our organisation. In order to create a more financially sustainable organisation we have to continually seek a variety of funding streams and find ways to generate income so we can continue the service we provide. It is really important to have a variety of funders so having funding from The Short Breaks Fund will encourage other organisations to support us. Indepen-dance will provide 3 x weekly Creative Movement and Dance classes over a period of 43 weeks for disabled adults. All classes aim to offer participants improved well being as an outcome of participation. We aim to offer carers a break from the role of carer. Indepen-dance collects feedback from class participants on a regular basis to determine if we are meeting our aims and objectives, from the feedback gathered we can measure the benefits participants report they have received. Participants have recorded that they feel happier, feel fitter, feel more confident and have made new friendships by participating in the regular weekly dance activities. By offering a regular weekly activity which is offered over a period of 43 weeks in a year they're is the opportunity to see individuals progress. Our classes run year on year and are not solely project to project based therefore you can often see the marked improvements in individuals as the years pass. Indepen-dance have been providing a regular core programme of activities for over 22 years many of the participants come on a regular basis and have been attending our service for a number of years. This is a lovely way to see our participants grow and develop over the years. To expand on what was previously mentioned 2 participants who have attended our Friday Night Social classes on a weekly basis and who had initially attended the classes as a social activity have now started to attend one of our Performance Company Classes. This demonstrates for our organisation that the participant is showing commitment to progress their skills in dance and increase their involvement in dance, so turning a hobby into something a little more serious. The Performance Company classes require a degree of commitment and dedication to see results but there is rewards in return by increase your ability in dance skills, having opportunities to perform as a variety of events with other added opportunities like participating in residencies away from home. The Friday Night Social Class was the entry level for the 2 participants but it will have far reaching benefits for the future if they continue participating in our Performance Company Classes.